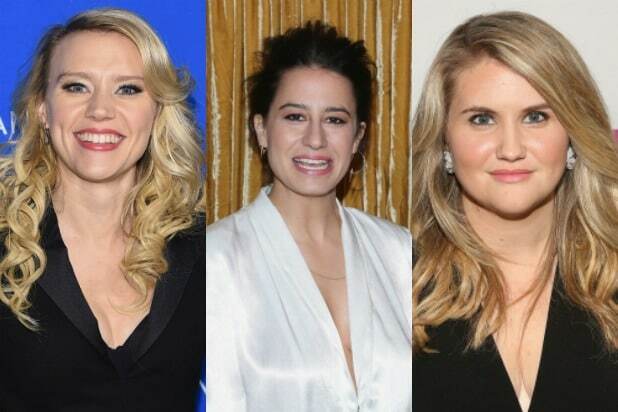 Gifted comediennes Kate McKinnon (“Saturday Night Live”), Ilana Glazer (“Broad City”) and Jillian Bell (“Workaholics”) are set to join Scarlett Johansson and Zoe Kravitz in an R-rated Sony comedy currently titled “Rock That Body,” TheWrap has learned. Lucia Aniello (“Broad City”) will direct from a script she co-wrote with Paul W. Downs that was voted to the 2015 Black List. The duo will also produce under their Paulilu banner along with Matt Tolmach and Dave Becky, who did not respond to multiple requests for comment over the past month. Story follows five friends who get a beach house in Miami for a wild bachelorette weekend that goes completely off the rails. The film will start production in August and is being eyed for a summer 2017 release, according to insiders. Sony executive Jonathan Kadin will oversee the project on behalf of the studio. Sony has worked with all three actresses before, as McKinnon stars in the studio’s upcoming “Ghostbusters” reboot, while Glazer and Bell co-starred in “The Night Before.” Bell also played a villain in Sony’s “22 Jump Street,” while Aniello and Downs are co-writing a “Jump Street” spinoff for Sony. McKinnon has been busy filming DreamWorks’ comedy “Office Christmas Party” with Jennifer Aniston and Jason Bateman. She is lending her voice to two animated comedies this summer — Pixar’s “Finding Dory” and Sony’s “The Angry Birds Movie.” She’s represented by UTA, Principato-Young Entertainment and Hansen, Jacobson. Glazer stars on Comedy Central’s “Broad City” and recently created “Time Traveling Bong,” which she also stars in and executive produces. She’s repped by UTA and Jackoway Tyerman. Like McKinnon, Bell is also filming “Office Christmas Party,” and the duo are also attached to star alongside Emma Stone in the 20th Century Fox comedy “Women in Business.” She also voices a character in “The Angry Birds Movie,” and will next be seen in New Line’s Ice Cube-Charlie Day comedy “Fist Fight.” She’s repped by UTA, 3 Arts Entertainment and Stone, Genow.